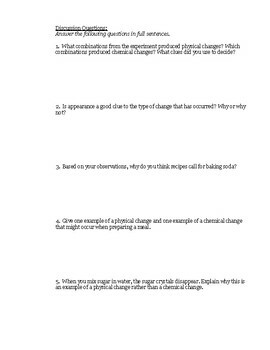 In this science lab, students are asked to complete experiments to "name the change". Do they see a physical change or a chemical change? Examples from this science lab include adding vinegar to an eggshell, water to baking soda, and yeast with sugar and water. 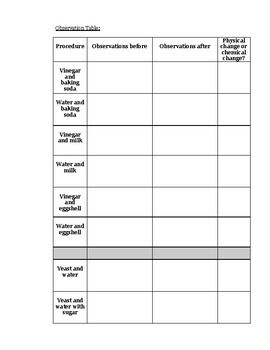 This resource includes a page of step-by-step instructions, an observation table, as well as comprehension questions about the activity. 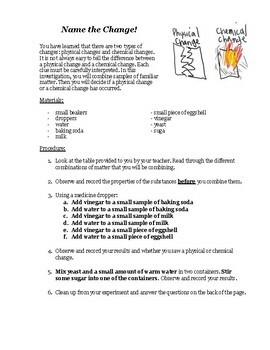 This activity is best completed after students have learned about these different types of changes, thus providing students with an opportunity to demonstrate their understanding in a hands-on way!